A number of exciting activities are being pursued by companies and entrepreneurs in the commercial space industry. These initiatives have grown out of planning that was done over 25 years ago. 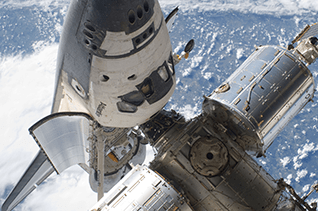 Focusing on emerging opportunities in the logistics and manufacturing sectors of commercial space, Stephen Wasko will discuss his experience attempting to foster this activity on the Space Shuttle and in the early days of the International Space Station (ISS) program. You’ll learn that a surprising number of current breakthrough ideas were pursued years ago, but we may finally have the technological and regulatory framework in place to allow them to be realized! Stephen Wasko is Principal and Owner of Wasko Associates, an operations and financial consulting firm specializing in small to mid-sized company development and growth. He has over 25 years of management experience in the life sciences, healthcare, advanced materials and nanotechnology, software, telecommunications and aerospace industries. Earlier in his career, Wasko was a Program Manager in the Shuttle Orbiter Division and Assistant Director of Technology Development for the National AeroSpace Plane Program – both at Rockwell International, and was Senior Manager for Commercial Development in the Space Station Division of McDonnell Douglas Corporation. Wasko holds a B.S.E. in aerospace engineering from the University of Michigan, an M.S. in the same field from the University of Southern California, and an M.B.A. from the Harvard Business School.